Here I am testing out the blog feature of flickr. 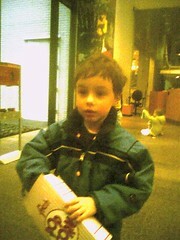 Elliot and I went to see a show called Reeling this weekend at the Minneapolis Children's Theater. What a blast. As you can see, we also had popcorn.